A New Digital Camcorder | Vanity and Everything in Between. Last weekend, I finally gave in and bought a digital camcorder! I've been looking for months now for a digital camcorder that delivers good quality yet budget friendly. 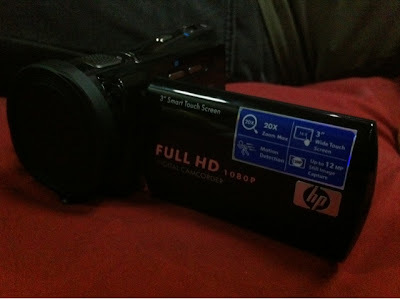 I've read reviews about HP's digital camcorders and most of them were nice reviews. When I checked their items at Anson, V5570u is noted as their best-seller. See, my budget for a digital camcorder was between 10-15 grand. I know I could have just settled for a new digital camera (which is also on my to-buy list this year). But I don't know, there's something about a digital camcorder that makes me want to buy one so bad. I'm guessing it's because of the smart touch screen that could be rotated almost 360 degrees. And oh, I'm also looking for a soft box (light) to go with this so I could film at night! There's something about filming a makeup tutorial. I still can't pinpoint what exactly it is. But it is addicting. I've already used this baby over the weekend and I'm liking it so far! So, expect better videos on YouTube because they will be in full HD!